Synopsis- From the late 19th century, when the Raj was at its height, many of Britain’s best and brightest young men went out to India to work as administrators, soldiers and businessmen. With the advent of steam travel and the opening of the Suez Canal, countless young women, suffering at the lack of eligible men in Britain, followed in their wake. They were known as the Fishing Fleet, and this book is their story. For these young women, often away from home for the first time, one thing they could be sure of was a rollicking good time. By the early twentieth century, a hectic social scene was in place, with dance parties, picnics, tennis tournaments and perhaps a tiger shoot and glittering dinner at a raja’s palace thrown in. And, with men outnumbering women by roughly four to one, romances were conducted at alarming speed and marriages were frequent. But after the honeymoon life often changed dramatically: whisked off to remote outposts, they found it a far cry from the social whirlwind of their first arrival. Anne de Courcy’s sparkling narrative is enriched by a wealth of first-hand sources which bring this forgotten era vividly to life. 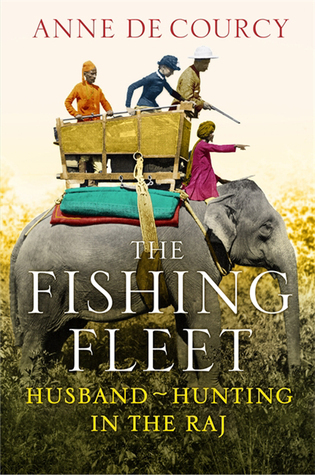 Review- When I requested a copy of The Fishing Fleet in the Raj for some reason I thought it was a fiction story, rather it’s a non-fictional account of the husband-hunting phenomena of the 19th century when the British infiltrated the Raj. British soldiers were residing in a male-dominated setting and so women were sent out on boats to snap up a husband (a.k.a The Fishing Fleet), with men outnumbering women the ladies had plenty of options! But it wasn’t all fun and games, many of the British women who married men in the Raj had to deal with many separations, losses and at times isolation. They were often apart from their husbands due to his work duties and once their children reached school age they were sent back to England to obtain an education. Anne de Courcy provides a voice for these women via authentic diary entries and data of the time. At times the women’s observations of the foreign land were fascinating and at other times were quite offensive- a time where racial prejudice was distinctive among the white towards the Indians. De Courcy carefully provides an objective account of the women of the Fishing Fleet and doesn’t get into the ethical or moral issues pertaining to the invasion. I found myself empathising for the natives, India (a.k.a the Raj) as some of the diary entries revealed narrow-minded women who lacked cultural awareness and appreciation. I also have a bit of a soft spot for India since I visited this amazing country recently. The Fishing Fleet was an interesting historical interpretation about the husband-hunting prodigies which I had never heard of prior to picking up this book. I would love to read a fictional story inspired by the Raj setting during this time.